BMW warrants these parts to be free from defects in material and workmanship. BMW will not accept any liability for damage resulting from installation of parts and accessories not approved by BMW. BMW cannot test every product made by other manufacturers to verify if it can be used on a BMW safely and without risk to either the vehicle, its operation, or its occupants. 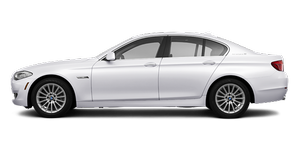 Genuine BMW Parts, BMW Accessories and other products approved by BMW, together with professional advice on using these items, are available from all BMW centers. Installation and operation of non-BMW approved accessories such as alarms, radios, amplifiers, radar detectors, wheels, suspension components, brake dust shields, telephones, including operation of any mobile phone from within the vehicle without using an externally mounted antenna, or transceiver equipment, for instance, CBs, walkietalkies, ham radios or similar accessories, may cause extensive damage to the vehicle, compromise its safety, interfere with the vehicle's electrical system or affect the validity of the BMW Limited Warranty. See your BMW center for additional information. Maintenance, replacement, or repair of the emission control devices and systems may be performed by any automotive automotive repair establishment or individual using any certified automotive part. ▷ New Vehicle Limited Warranty. ▷ Rust Perforation Limited Warranty. ▷ Federal Emissions System Defect Warranty. ▷ Federal Emissions Performance Warranty. ▷ California Emission Control System Limited Warranty.